If you tuned into the Star City Games Invitational in New Jersey this weekend, you had the pleasure of seeing somewhat fringe contender Elves take down the Top 8. 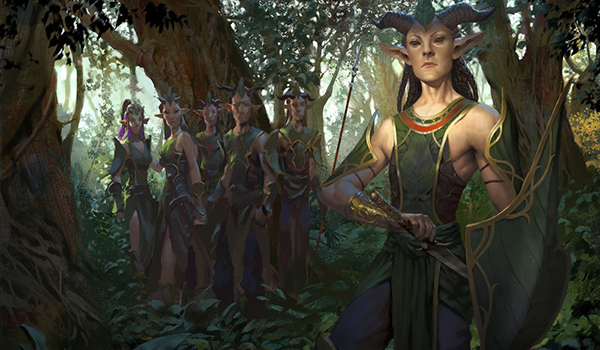 Elves is certainly not an unknown quantity, but it also doesn’t exactly make the list of decks Moderners expect to face at every tournament. Going into this weekend the stories on everyone’s mind were Jund, Death’s Shadow Zoo, and Dredge. While each of these performed reasonably in their own right, putting a player each into the Top 8, Liam Lonergan’s win in the finals is a reminder that on any given day, it’s anyone’s guess what archetype will hoist the Modern crown. Elves has been in the Tier 3 standings for two months now, after falling from Tier 2 during May. Clocking in at around 1.4% of the metagame, Elves is straddling the line between Tier 2 and Tier 3, and its paper shares (2%) imply a deck that has simply seen more adoption in real life than on MTGO. Many builds splash black for Shaman of the Pack, but Lonergan elected to cut the color for white cards out of the sideboard and a more robust toolbox package. As a creature-based combo deck, Elves shares much in common with Kiki Chord and Abzan Company. Where those decks, however, play a midrange value game with a two- to three-card combo as an oops-I-win button, Elves slants more towards the aggressive side. There are no infinite combos here or automatic win conditions, but rather a critical mass of dorky, replaceable creatures that snowball into an insurmountable onslaught as the game goes on. In this way it parallels the premier “aggro-combo” deck of the moment, Dredge—neither deck aims to assemble a particular set of cards, but rather functions by leveraging synergy to create an aggressive game plan that’s greater than the sum of its parts. Where Dredge’s synergy revolve around the graveyard, Elves’s revolves around the production of copious amounts of mana—one of the hallmark mechanics, of course, of the Elf tribe. We see the full 8 Elvish Mystic/Llanowar Elves augmenting Heritage Druid in the one-drop slot, along with Elvish Archdruid (and a one-of Nykthos, Shrine to Nyx) to push the mana generation to truly absurd quantities in the midgame. As a one-drop, Heritage Druid is probably the most explosive accelerant in the format, capable of breaking open the normal rules of Magic if left unattended—to say nothing of Archdruid, which gleefully taps for 5+ mana with no trouble. Elves is also uniquely positioned to take advantage of Chord of Calling, which becomes a zero-mana spell more often and earlier than in other decks. Compared to its sister toolbox/combo decks, Elves is far more explosive, aiming to flood the board with a pile of indiscriminate creatures as early as turn 2. The deck achieves its “threshold” requirements with Collected Company, cantrips in Elvish Visionary and Horizon Canopy, token makers in Dwynen’s Elite, and simply by virtue of a lower average converted mana cost. All of these elements gel together to create the “snowball” effect that earned earlier versions of “Elfball” its name—once the deck has begun to amass its advantages it becomes very hard to arrest barring a sweeper, and the engine keeps spiraling further and further out of control. The first way Elves looks to capitalize on this ballooning board presence is by simply attacking. It doesn’t take many Elvish Archdruids to turn scads of 1/1s into a lethal attack, and even if one or two have to chump-attack the damage output will be formidable. Of course, this is assuming the Elves pilot can’t cantrip, CoCo, or Chord into its signature win condition, Ezuri, Renegade Leader. On most of the board states I saw on camera at the Invitational, a top-decked Ezuri was well beyond lethal, often through multiple blockers. It wasn’t uncommon for him to Overrun several times in a turn. The regeneration clause is no slouch either, making the Elf army that much more terrifying on attacks and resistant to red sweepers like Pyroclasm and Anger of the Gods. A single untapped Elvish Archdruid will regenerate the whole squad, making the prospect of combat steps for your opponent an even more daunting affair. The other main way Elves converts their massive board presence into a double-u is, of course, the glaring omission from Lonergan’s build: Shaman of the Pack. The long-time Elves pilot apparently believed it was unnecessary, and as we’ll see cutting black allowed him to make room for more white options in the sideboard. I frankly have zero idea if this is the correct build, but I’m inclined to defer to the man who ran the archetype to successive finishes in an SCG Classic, an IQ, and finally his win at the Invitational. What good would a Chord of Calling/Collected Company deck be without its spicy (and/or par-for-the-course) bullets? Lonergan’s maindeck keeps it short and sweet, with Spellskite, Eternal Witness, Scavenging Ooze, and Reclamation Sage. That already covers a wide range of strategies and specific threats in Modern, and the sideboard brings more fun. Essence Warden for Burn; Melira, Sylvok Outcast and Spellskite for Infect; Eidolon of Rhetoric for Storm and Ad Nauseam; Kataki and Ooze to beat up Affinity and Dredge—there’s no shortage here of powerful linear answers to Modern’s panoply of linear decks. (Side note: think how dumb Ooze is in this deck—you might well exile the entire opposing graveyard every single turn off of Archdruid mana.) Against the fair strategies, Phyrexian Revoker will shut off Grim Lavamancer, Burrenton Forge-Tender provides another out to Anger of the Gods, and Chameleon Colossus laughs at Jund’s removal suite. Like with other Chord decks, the Elves pilot gets access to all these tools by committing just one sideboard slot. These tutor targets are complemented by some classic sideboard staples like Path to Exile and Kitchen Finks. Note that although Lonergan didn’t use the knock-out punches of Rest in Peace or Stony Silence, both can be easily slotted in if the metagame calls for it. I’ve said it bajillions of times before, but the ability for lower-tier decks like Elves to take down tournaments like we saw this weekend is one of Modern’s most wonderful characteristics. Lonergan clearly put in a ton of time mastering this archetype, which paid serious dividends for him in the form of $10K and a first-time queue for Pro Tour. In case you were wondering if the Invitational’s split format was to blame here, Lonergan’s Modern record in the Swiss was a pristine 8-0. Whether this is because Elves found particularly excellent metagame conditions this weekend, or Lonergan brought a complete mastery of the deck to bear on the field, it remains true that Modern is any archetype’s format. I’ve been playing a non-shaman build for a long time (despite owning a full foil playset) and it never seemed to be any worse without them. I guess you are trading one form of speed for another. It seems to work anyway. Great deck and always a contender at any fnm or tournament I’ve had the pleasure of entering. Thanks for the kind words, Jason. If I could go back and change one thing about the deck for the weekend, it would be to take out the Eidolon of Rhetoric in place of a Selfless Spirit. Non-creature combo decks seem almost nonexistent, but Wrath of god, Damnation, and Kozilek’s return seem to be picking up in popularity, none of which are stopped by Burrenton Forge-Tender.